"If inferior people have 4 children while higher-quality people have 2, this is what will happen." The previous lectures on Hitler and the haphazard development of the concentration camps raised the question of the origins and causes of the Nazi genocide. Many scholars argue that Hitler had a clear plan for mass murder in his mind since the early 1920s, but the many twists and turns in the haphazard development of the system of mass murder indicate that this plan emerged gradually. Still, we need to know where the idea of genocide came from.
" 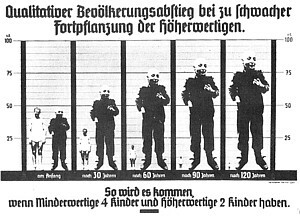 Most historians have attempted to account for the horrible excesses of Nazi science in one of two ways: as perverted by politicians, or as perverted by scientists. I think that each of these accounts is at best narrow, at worst deeply flawed. Both lead us away from a proper understanding of Nazi medicine—as an important expression of Nazi social structure and culture." 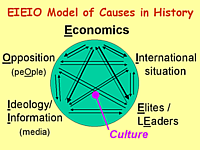 On the EIEIO model, this indicates that two Elites played a role: political and scientific, as well as the institutionally anchored structure of German culture. 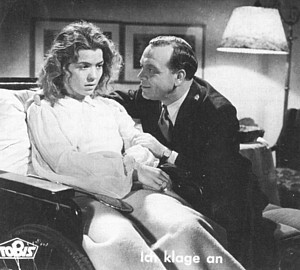 In the films we saw, Existence without Life (the one with the fictitious lecture at Munich university) showed a professor arguing that the support of the institutionalized disabled was a huge burden on Germany's Economy. That prof's unscientific arguments point to the role of Ideology. 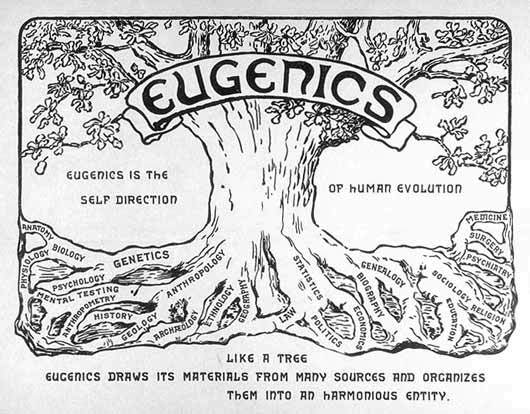 Today I'll talk mostly about the international connections (especially to the eugenics movement in the US), and the role individual peOple's Opposition played in forcing the program into an even more stealthy mode in 1941. 1916: Madison Grant (1865-1937), The Passing of the Great Race: or, The Racial Basis of European History (New York: Scribner, 1916, 1918, 1919, 1921, 1922 [1970, 2002]), 476 pages; UCSB: GN575 .G75 1916 and 1921. (New York: Macmillan, 1918, 1922, 1925, 1933), 459 pages, UCSB: HQ751 .P6. 1927: Supreme Court affirmed Virginia's law in Buck vs. Bell (Carrie Buck was sterilized because of sexual promiscuity"--she had been raped by a relative of her foster parents). In the majority opinion Justice Oliver Wendell Holmes wrote: "It is better for all the world, if instead of waiting to execute degenerate offspring for crime, or to let them starve for their imbecility, society can prevent those who are manifestly unfit from continuing their kind…. Three generations of imbeciles are enough." Eugenics soon moved to encompass not only "positive" selective breeding, but "negative" selective weeding out of people deemed inferior--termed euthanasia. 'The grand plan was to literally wipe away the reproductive capability of those deemed weak and inferior--the so-called "unfit." The eugenicists hoped to neutralize the viability of 10 percent of the population at a sweep, until none were left except themselves. General use of euphemisms and code words, e.g. Film Selling Murder: The Killing Films of the Third Reich ( Discovery Channel, 1993), 45 mins., based on research by Michael Burleigh, published in his Death and Deliverance: 'Euthanasia' in Germany, 1900-1945 (Cambridge Univ. Press, 1994), esp. chapter 6, pp. 183-219. 1941: I Accuse, ( Ich klage an); prize-winning feature film with famous actors, 18 million viewers. Pianist has multiple sclerosis, given poison by husband. Good sources on this in Burleigh/Wippermann, The Racial State (1991), 137-167, esp. 158ff. early 1940: killings in institutions began (by Carbon monoxide gas in cylinders). 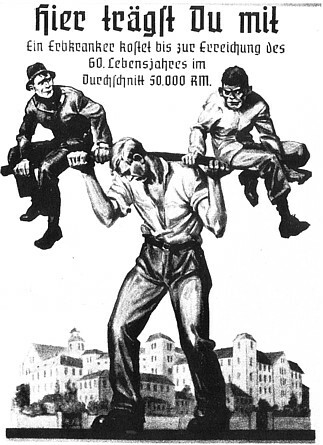 Six institutions were used: Grafeneck near Stuttgart, moved in January 1941 to Hadamar near Frankfurt; Brandenburg prison, moved in Nov. 1940 to Bernburg an the Saale; Hartheim near Linz; Sonnenstein near Pirna. 70,273 persons had been murdered by gassing; including those killed by other means 93,251 institutional beds for the mentally ill had been "released"
Role of the sermon: Was the program going to be stopped anyway after the reassessment period? 1942ff: continued as "Aktion 14f13" [filing system number] in concentration camps. Reference: Beth Griech-Polelle, Bishop von Galen: German Catholicism and National Socialism (New Haven: Yale, 2002), 259 pages. What did the German populace know, and what did they do about it? Pernkopf Anatomical Atlas (4 vols., 1943ff; republished in 2 vols. in 1960s and 1980s). See text beginning with notes 22-23 in William Seidelman, "On Science: Medicine and Murder in the Third Reich," Dimensions 13:1(199x).